It’s been a long year since we were last on the ice with RAID. Our first field trials ended in January of this year, when we buttoned up for the coming austral winter. 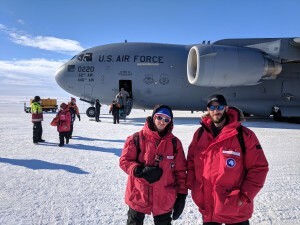 All of the modules sat quietly on snow berms outside of McMurdo Station while the RAID team members went about their own tasks through the intervening months. We prepped for a second season of drilling trials by going over equipment needs, modifying procedures, and being sure that everyone is ready for what lies ahead. Earlier this month the first of our drilling team — Rich, Brian and AJ — flew down to Christchurch in New Zealand, where they promptly sat for over a week! They hit a bad weather cycle in McMurdo, which kept them on hold every day hoping that a flight would launch for the last leg to Antarctica. Waiting is the name of the game in this situation, but at least they didn’t end up on ‘boomerang’ flights to the ice and back. Eleven days after arriving in Christchurch they finally made it to McMurdo! The passenger terminal in Christchurch, waiting to board a flight south. 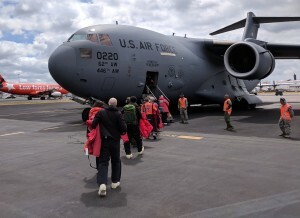 Boarding a C-17 for the flight to McMurdo. AJ and Rich arriving in McMurdo on the ice runway. The drillers are now digging in to get all of the modules ready for an over-snow traverse out to our test site at Minna Bluff. This is the same location where we were last year. We have five modules all together — drill, rods and casing, power, fluid recirculation, and shop — which need to be uncovered, opened up, and readied for traverse. Operations folks already on the ground in McMurdo did a great job getting into the power module to warm up and fire up our twin generators after a long frozen winter. 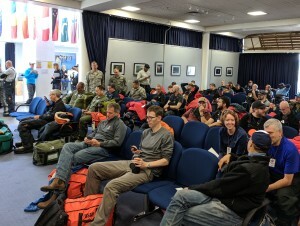 Preparations seem to be well in hand despite the weather delays and the traverse team is hoping to depart McMurdo on November 25th. 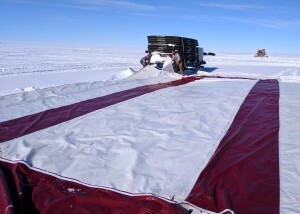 Rolling out the tarps after uncovering the modules. Our basic goals for this year are to set up camp at Minna Bluff, slightly moved from last year, and get ready to drill three holes through grounded ice, across the glacial bed, and core into bedrock. We’ll take it slow but have the month of December and into January to experiment and ratchet up our drilling rates. We will have 15 in camp this year — six drillers, five in the science party, and 4 camp staff.